You’ll recall the Tyrrelstown amendment. And how it was added to the Planning and Development (Housing) and Residential Tenancies Bill 2016 before Christmas. It had originally proposed that where a landlord proposes to sell 20 or more units in a development – within six months – the sales would be conditional on existing tenants being able to remain in the property unless there were exceptional circumstances. 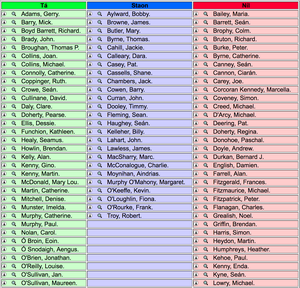 During a Seanad debate on this amendment, the number was changed from 20 to five. However, on foot of advice from the Attorney General, the Minister for Housing Simon Coveney increased this figure, from five to 10. Focus Ireland proposed an amendment to the Planning and Development Bill 2016 to protect all tenants of buy-to-let properties from being evicted or served termination notices, on the basis that their landlords were selling the property. The amendment was moved by Tipperary Independent TD Seamus Healy (above). However, it was lost with 43 votes for; 52 votes against and 25 abstentions. Independent TD Stephen Donnelly and director of advocacy Focus Ireland Mike Allen spoke to Seán O’Rourke on Today with Seán O’Rourke this morning. They spoke about the Tyrrelstown amendment and the rejected Focus Ireland amendment. Mike Allen: “Good morning, Sean. What we’ve been seeing over the last year is, we reckon around a third of families who are becoming homeless in Dublin are becoming homeless because their landlord has been forced to sell up, one way or another. And it’s very hard to know exactly what’s happening there. But, talking to the families in our services and elsewhere, there’s a strong sense that landlords, these particular landlords are being forced to sell up, either by banks or by vulture funds because they, themselves, have got behind in their mortgages. And the Tyrrelstown amendment, while it’s very positive for the places that it effects – Tyrrelstown in particular, in retrospect. You know, they’re trying to address that issue retrospectively. It doesn’t deal with the vast majority of landlords. “There’s over 15,000 tenancies where the landlord is in arrears for more than two years and, not all of those by any means, but a significant number of those tenants are completely unaware themselves but they’re at huge risk of being evicted and ending up in homeless services and we don’t seem to be doing anything seriously or urgently about that. Posted in Misc and tagged Focus Ireland amendment, Tyrrelstown amendment at 12:15 pm on January 13, 2017 by Broadsheet. 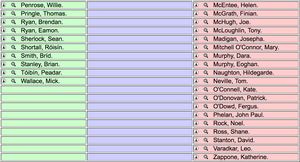 I don’t see Stephen Donnelly’s vote in breakdown above. Don’t see quite a few TDs in the breakdown. If you don’t bother turning up, are you put down as an abstention or do you have to say you are absenting? Where is Michael Martin or Michael McGrath? I think the issue is that in practical terms, protecting all tenants would lead to a situation where people seeking to purchase residential property to live in themselves (ie owner occupier) would be effectively unable to purchase anything which is currently in the BTL sector. It would leave all BTL property only available to professional landlords. Which would seem to be a stupid outcome if it were to have occurred. Why would it be a stupid outcome? The stupid outcome would be people being forced out onto the streets because a landlord wants to sell up. You would be able buy but with tenants in situ and then you would have to terminate their tenancy yourself. This would be fine in 90% of cases I am sure. But buyers would need substantial discounts to insure against the possibility of an uncooperative tenant. Most solicitors would advise their client not to go ahead with this (I know as this issue featured when I was selling my own house which I had become an accidental landlord of), as there is no telling what sort of issues may arise whilst trying to get the existing tenant out. Its a completely pragmatic threshold that they have left in the legislation. Let’s be clear here, the only reason the likes of the people in Tyrrelstown or down in the Strand apartments in Limerick are being forced out, is because these peoples’ homes are going to be rented out again by the new investor, but at higher prices. You could find yourself googling somewhere to live again from your sh*tty run down B & B, and there you see your old apartment being advertised for 500 more a month. The number of 5 being sold together was appropriate to protect tenants, not 10. And I would hope there’s some provision to stop vultures or whoever selling in smaller batches, but at the same time. it’s the number of units sold within 6 months. So if you sold 1 a week for 5 months it would kick in. I’m not sure how it would be enforced retrospectively. If I sell 9 properties, and kick out the tenants before buying, does this stop me selling further properties in the 6 months? 6 months is too little.. and 10 is too high. so zero and infinity then? I’d have no problem with anyone selling as many properties as they like, as often as they like, if tenants were protected. Proper security of tenure and rent controls don’t have to impinge on sale of properties. Poor that Stephen Donnelly wouldn’t know the number.. He’s paid to know this stuff like. If it’s sold with vacant possession-how’s it BTL? it’s BTL if the person buying it is doing so with the intent to rent – as apposed to buying it to live there. My aunt would be my uncle if she had a pair off b**ls,try specsavers. Mike Allen: “Good morning, Sean. What we’ve been seeing over the last year is, we reckon around a third of families who are becoming homeless in Dublin are becoming homeless because their landlord has been forced to sell up, one way or another. And it’s very hard to know exactly what’s happening there. 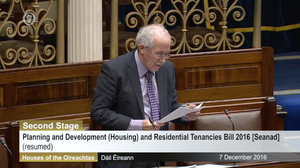 But, talking to the families in our services and elsewhere, there’s a strong sense that landlords, these particular landlords are being forced to sell up, either by banks or by vulture funds because they, themselves, have got behind in their mortgages. So what happens when a BTL dwelling is sold because of arrears? Does it just disappear into a black hole? No. The new owner will either live in it or let it to someone else. Arrangements for terminating tenancies have ZERO NET IMPACT on the number of houses in Ireland. The real issue is the very slow pace of new house building which no one really has a policy prescription for. Likewise, arrangements to protect existing tenants, have zero net impact on the number of houses in Ireland. Potential reduction in value huh? Who’s rights are considered more important? The rights of a landlord to maximum profits or the rights of ordinary citizens to not be turfed out onto the streets. There are hundreds of thousands of people now renting. Landlords are lobbying for more and more tax breaks. I saw a headline recently that they are going to be able to deduct local property tax now as an expense. there’s a whole plethora of expenses Revenue will allow you to claim back on to reduce the amount of tax you pay each year. You can’t have it all ways. We need to protect the thousands of people now renting.. they’re voters after all. According to Coveney – if there is a landlord selling one property (which affects one* tenant) the landlord’s rights are considered more important than the tenant’s. If there is a landlord selling ten properties (which affects ten* tenants) the tenants’ rights are considered more important than the landlord’s. * I’m aware there can be more than one tenant, but that’s the gist of it. Everyone seems to treat the third of three paragraphs like it’s a typo. It’s completely ignored. The constitution doesn’t grant unrestricted property rights – governments do. And ‘social justice’ would tend to suggest that no one should be made homeless for the sake of a few extra grand on a sale price for the landlord or his/her creditor. It doesn’t mean you have to tack on an arbitrary restriction. Is it socially just that a landlord adding 5% to his sale price trumps a contract he signed with the tenants – who he is now prematurely evicting for enhanced profit – into the middle of the worst housing and homelessness crisis we’ve seen? Whether it’s one family, 5 families or 20 families – is it socially just? I think the sales clause is included in the contract, no? @ Owen C. What would we do without you telling us about the existing state of affairs. I recall someone on here recently saying their landlord owned numerous properties in the same area and that he advised all of his tenants in the different houses that his sister was moving in. He didn’t have 8 sisters, it was just the one sister with the same ugly mutt head on her. A signed statutory declaration from the landlord, is required both for stating that a family member is moving in, and if he’s saying he’s selling up. The landlord can end your tenancy if they intend to sell within 3 months. They must provide a signed statutory declaration that this is the case. The landlord must provide a signed statutory declaration that they require the property back for their own or a family members use. The law on this was tightened in late 2014 by Alan Kelly. Any affiliation to FG fact checker? Any affiliation to rational thought? Some chancer saying his sister is moving into 8 different properties or 4 or whatever the number was, needs the fear of god put into him and advised pronto that what he’s doing is illegal and further action may be taken etc etc. So if I want to sell 15 properties I could get around that very easily. Weeks beforehand you just set up different companies and sell them off. There is slightly more to it but it is that easy. I wonder if some of this is due to returning emigrants who had let their houses out while they were away? And now they want their house back to live in it? no, this is relating to selling houses. if you let your house while you were away, and want to live there you can evict your tenant (with due notice). This is more to do with a landlord selling a property to another person who will also let the property. The question is why the tenant is affected. If I went off abroad, I would think it’s only fair that I find myself someplace else to live upon my return, if there are people already living in a house I have been renting to them for years. It’s all to suit landlords. It’s ridiculous. If I decide to move somewhere for 5 years and rent the house while I’m gone, I’m completely within my moral rights to reclaim my property when I return (obviously with reasonable notice). To assert otherwise is being ridiculous. Unlike ye shower of heartless neoliberal rentboys, I happen to think where people live is something that’s very important to them. But not to confuse the issue, we’re talking landlords with more than 1 property in the country. Not emigrants with 1 property returning home. Coveney happens to think the hundreds of thousands in rental accommodation whose landlord owns 10 or less properties are not worthy of protection from being forced out onto the streets, as it doesn’t make headlines when it’s not happening in any big numbers at the same time. Make up your mind, you were the one that brought up the stupid assertion that a single landlord returning from abroad had no right to their own property. Make up my mind about what? Listen up Rotsey, these are my views on the matter. We’re talking about landlords with buy to let properties. It would be easy enough to ascertain if someone owns more than one property. I think tenancy rights are very important. It’s the roofs over peoples’ heads we’re talking about. I do not think a priority should be given to landlord’s potential reduction in value, upon the sale of a property, over that of making someone homeless. Coveney says it’s proportionate and justified that the rights of 40 tenants in 40 properties should override the property rights of an individual landlord. Well guess what, overall there are far more people renting than there are landlords. Just because it won’t make headlines when done to thousands of renters but not in big batches at a time, doesnt mean it’s fair. We have a party of and for landlords. They want it all ways. They want to gouge and change tenants what they like, they want to pay no taxes on the income. They want tenants to contribute to their pension fund in full..and they want to be able to turf them out when it suits as it may reduce the value of their ‘asset’ (a place someone has made their home). Rotide is a hateful persona on this site. Several countries including India do not allow non residents own property in their country. Emigrants should make up their mind where they want to live to use your hateful analogy. Your words Anne. That doesn’t sound like a BTL landlord. Dublooney brought it up Rotsey and I feel like tenancy rights are very important no matter what the situation. As things stand it’s pretty dismal for tenants. A party of and for landlords is what we have. Who do you support as a matter of interest? “Let us suppose a landlord is an owner of 40 properties each with tenants. It is surely both proportionate and justified that the rights of those 40 would override the property rights of an individual in the Constitution. Just on that, if we’re deciding whose rights have a higher priority based on numbers. We have more renters than landlords. Hundreds of thousands of people are not worthy of protection who are renting from landlords who own 10 or less properties. How is that appropriate? You have to love the appeal to authority too given to the Attorney General. We went with 20 properties, then 5, then the Attorney general said 10, as that arbitrary number is what the Attorney general said. Wonderful. From what I read in the media, judges almost never evict families from homes when they are making some effort to engage with the lender. Just go down to the courts any day of the week it’s hard to explain unless you experience it first hand. There’s a standing army of parasite monkey lawyers and guards grinding an organ chewing up people and spitting them out – lads with hundreds of convictions being “processed” like condoms out of a vending machine. That’s just the district courts. The high courts are way way worse. Like if you go in there as a lay litigant and don’t stand or speak at the right time or sit in the correct seat some silly little sycophant will berate you for it, as if the whole process wasn’t intimidating enough. As for examples look them up yourself your lordship there were several given here recently for example the Gibney Denham issue. So why was comment not posted. They’re trying to mess with your head dude…..
McGrath and Meehal are in the same constituency as Coveney…..
Are they just acting the bollox and planning sum’ting that’ll stitch that Snobby Langer up?